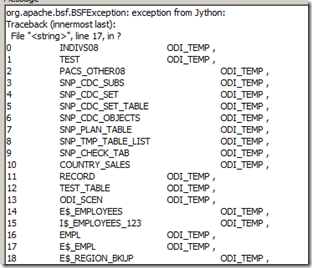 Few posts back i have shown ,how to display the value of the variable using Jython and today i am showing how to display SQL Query result in the operator. 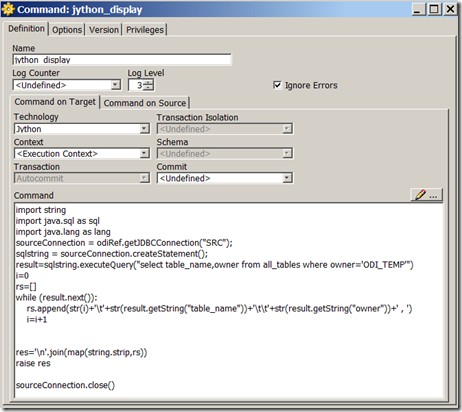 In sourceConnection = odiRef.getJDBCConnection(“SRC”), the connection details are retrieved from ODI , to do so in the ‘ command on Source tab’ – Select the Technology and required Schema so that ODI can retrieve the connection details. # Enter the query between the two double quotes or replace the above query . Enable the ‘ Ignore Errors’ option. What can i do getOther? Where list of types they can be get? 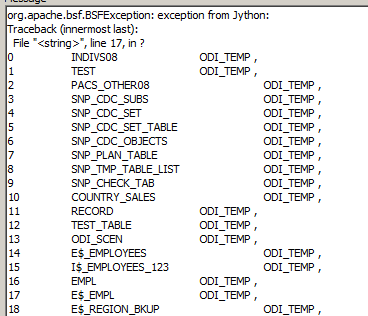 I suggest that it would good to let ODI manage the JDBC connection,, don’t go creating one yourself, use the odiRef,getJDBCConnection() method, then ODI will handle the connection automatically for you. Thanks again Craig for your valuable suggestion . The post is modified based on getJDBCconnection API. Raising an exception just to print out stuff seems crude, shouldn’t a simple println work? 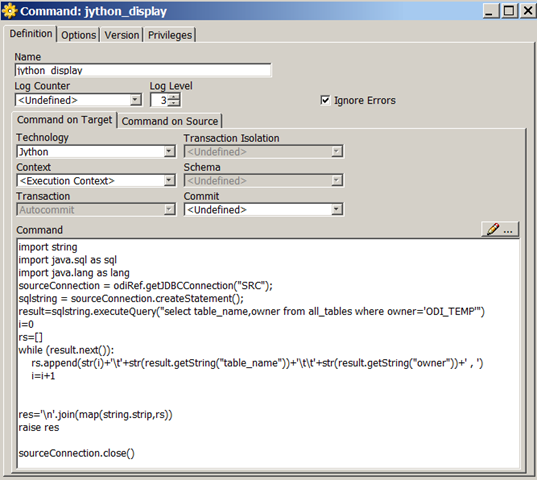 Thanks Markus for your suggestion , the reason i am calling a raise command is that using raise i can display the output as an exception in the ODI operator . Secondly i wanted to maintain the uniformity in the above two codes so i have used while loop , moreover just getting single line the second program can also be called like this too .